As you may have heard, our Women’s ACTS Retreat is taking place from May 30 to June 2, 2019 at the De Paul Retreat Center in Montebello. 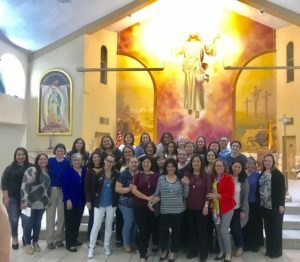 Under the servant leadership of Kathleen Greulich serving as Retreat Director, and Sara Aguilar, Annicia Fernandez, and Lupita Banuelos serving as Co-Directors, the amazing team of women are preparing to serve on Retreat. Stay tuned for the upcoming opportunities to support the team/ retreat in off-site services like Passing of the Candle, Send-off, Candlelight, and Return Mass. Also, we encourage you to support the various fundraisers that will be held to allow for Retreat scholarships and expenses. Finally, we encourage you to spread the news about the upcoming Retreat and invite family and friends to attend the life-changing Retreat. Click on the link below to download a copy of the 2019 Women’s ACTS Retreat Application.